I believe that we as human beings need and yearn to embrace that which is not like ourselves. We need mystery and transcendence for we all (religious or not) are drawn to the spiritual side of life, however you want to define that. We seem to sense that there is an element to life not verifiable by science. Some call it faith, others the human spirit. And, while we trust science to confirm all data, our minds are quite regularly seduced from that “laboratory” by that which transcends logic. We cherish ideas that can’t stand the heat of the science lab. We can’t tear ourselves away from movies about wizards, hobbits, and parallel universes. I see this all in the context of a parable I wrote in seminary, an analogy depicting the history of western culture through the relationship of two parents interacting at the family dinner table. In this essay, Father represents science and logic, and Mother, the spiritual and religious. If you can, let yourself imagine this interaction at the dinner table taking place over thousands of years where there are shifts in power, with periods of disconnect and divorce. 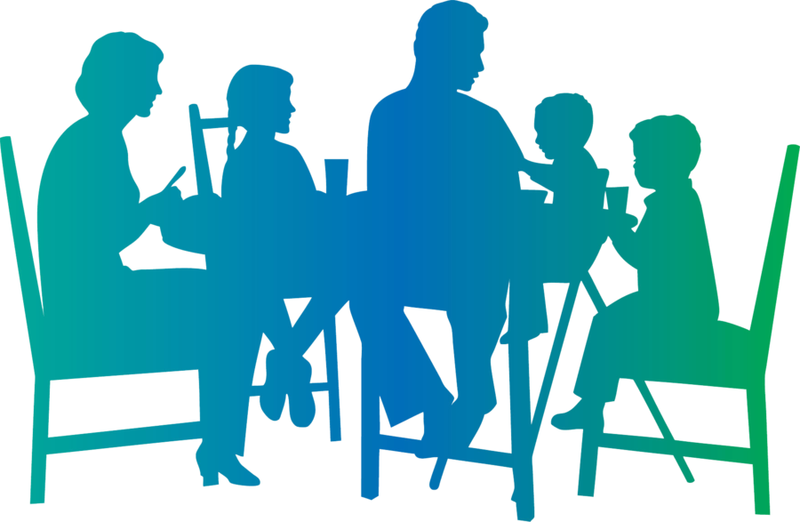 The human race sits like children at this table and is affected by the tensions between the parents on either end, and especially by the absence of one or the other parent. Children arrive at the table in waves of generations, watching the parental relationship groan and strain to mature in light of history’s developments. We are children of two truth parents – spirit and logic. From the time we crawled out of the trees we were as inclined to build altars as we were to make tools or a fire. Father-science lagged behind mother-spirit because Mother gave us the “big picture” very early on, and a sense of meaning. Mother-Spirit was a great story teller and was regularly creating stories about “the beginning of time,” and suggesting answers to life’s “big questions.” At the same time, Father was making tools and learning about fire, and this helped the human being survive danger and illness. He too, was asking many questions and testing his theories for answers. Father-Science had a somewhat slower start, at least as far as being able to answer the big questions. Mother-Spirit, whose talent was in story telling and hope-building, stepped up more quickly to speak on matters that touched or frightened the human heart. When Father-science finally developed instruments that could answer some of these questions his theories appeared to be in conflict with Mother-spirit who had gradually become the more powerful parent. The house was thrown into turmoil. Father-science got booted out to the dog house for disrespecting the authority of mother-spirit and the separation began. (Galileo?) Ah, but what a separation! In the dog house (what we now call the Enlightenment), Father had the solitude to stretch and grow. And thrive he did, out there beyond Mother’s authority. After some time, we, the children of this separation began to reevaluate our parents. Mother-spirit began to look old-fashioned and superstitious, while our respect for Father-science was growing. Father knew far more about this material world and we were truly impressed by all he could do. Intentionally or not, we began to ignore Mother-spirit, and turned our focus to Dad, who was, if nothing else, true and factual. Mother seemed a little frail. Her ancient stories about apples, whirlwinds, and a miracle in a lion’s den looked like nonsense in the light of Father’s discoveries. At the ‘truth’ family dinner table (which could easily be any of our hospitals today) mom sits quietly at one end of the table, while we all look to Father for answers at the other end. If Mother tries to speak, Father politely excuses himself from the room. So here we are today, waking up to find Mother missing entirely from the dinner table discussion. Curiously, I believe we are missing Mother when we are parented only by Father. You see, all of Father’s facts cannot keep us warm in our beds at night. It can surgically remove a tumor, but it cannot comfort our soul. And so we who have been raised on the internet, the chaos theory, and quantum physics, look for mother in art – in plays like RENT, and movies like Pursuit of Happyness, and Wall-E, and songs like U2’s Mysterious Ways. We miss Mother because we are, (all of us), born of two truth parents. We need each parent fully present in their own uniqueness. We, the children at the table, and our patients in our hospital, need what each has to offer – truth in its different genders. We celebrate science for it has uncovered the laws of nature and has given us the means to understand natural phenomena, and to cure illness. But we need the psychological, social and spiritual in our care, for when Mother speaks we hear singing, and are stirred in a part of our being that Father can’t touch. It is clear to me in my work in Pediatrics, that many health care professionals are tired of living with and working for a single parent. In our work, we see that there is more to healing than chemotherapy. We need both parents talking at the dinner table. And to you who will go on to be doctors and caregivers, do not forget that your patient needs both kinds of medicine dripping into their veins – science and spirit.